Giving things away freely – time, knowledge, possessions and money – has been and continues to be a truly valuable aspect of my freedom. My grandmother was a big inspiration. She lived simply yet, in the last years of her life, if you commented appreciatively about any item in her house she would suggest you take it. In part, her ‘gifting’ inspired my belief in the maxim: ‘from each according to their abilities, to each according to their needs’ – which, for me, is less ideology and more common sense logic for abundant living in a world of largely finite resources. 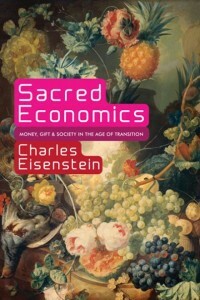 Interest in the wondrous wisdom of gift economics appears to be returning: from online platforms such as Ziilch, Justfortheloveofit and Freecycle (the latter has ensured 4.5 million tonnes of waste stays out of landfills through a simple advertisement-based mode of exchange), to a wide range of on-the-ground gifting practices and huge support for the stimulating thoughts of Charles Eisenstein, amongst others. And whilst interest is returning in many ways, in other ways it never left; Mali, for example, maintains a gift culture. Somewhat differently, I have read that the first words the Amish will often use when arriving at a neighbour’s house are not ‘how are you?’ but ‘what can I do?’ And, of course, nature is a wonderful gift economy from which we receive, every single moment. A method of gifting that universally brings a smile to the face is the ‘pay it forward’ model (global pay it forward day is April 25th). Yet, money is such a powerful drug and scarcity thinking so pervasive, how might people respond to an international day where people are encouraged to give their own money, or some equivalent, to complete strangers, asking them to pay half of this forward? 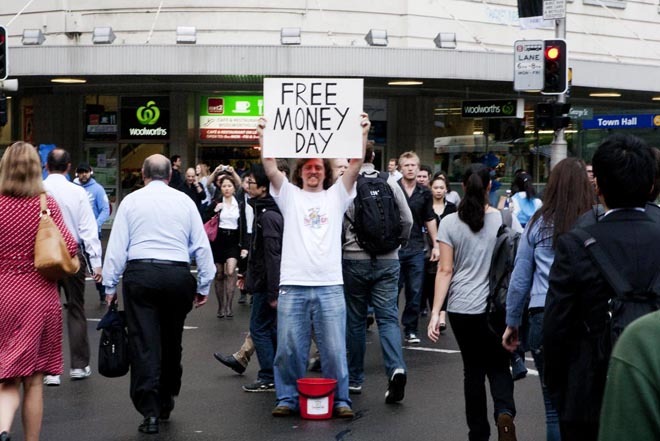 On 15 September 2012, Free Money Day was held for the second time, with 138 events across 24 countries including Nigeria, Thailand, Argentina, Russia and New Zealand. Over 50 events were held in the U.S. alone. As organisers, we at the Post Growth Institute were so excited (and sometimes intrigued) by the widespread coverage we received this year, notably including: the Huffington Post; Toronto Star; The Journal; Good; Stephen Fry; and Rabobank! A full range of photos can be found on Flickr, videos on YouTube and we had a particularly nice interview with Bondi Locals Radio in Sydney, Australia. 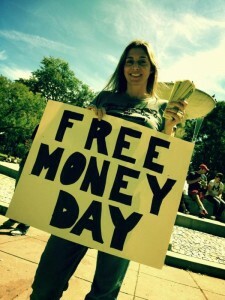 People became really creative with the Free Money Day concept. In Moerewa, New Zealand, buskers Emma and Derek handed out money to people listening to their music. Gonçalo’s video store in Lisbon, Portugal, gave free movie rentals and asked recipients to give to others in the street the money they would have spent. Similarly, Brian left $30 on ‘the tab’ at the Flying Hat Coffee Shop in Portland, U.S.A, with notes for customers saying: “this coffee has already been paid for. Consider yourself gifted… We encourage you to give away the money you would’ve spent on this coffee to a complete stranger”. At Hamimi, in Brisbane, Australia, staff gave away their own money to customers all day in memory of their late brother Andrew ‘Wilf’ Wilford who was involved in the inaugural Free Money Day. And one couple pledged to give away $30,000 of property in Thailand to a community land trust! (the first two farmers have since been invited to live on the land). In addition to money, Carol in Norway handed out free reading books. In the Pyrenees, France, Sally paid for the people behind her to enter the national park. In Cardiff, Wales, Justin and friends from Positive Money and other groups held a ‘skills auction’, where artists, musicians, technicians, filmmakers and web designers donated their skills and time, and people bid to have access to these skills. The proceeds were then used to hand out free money! 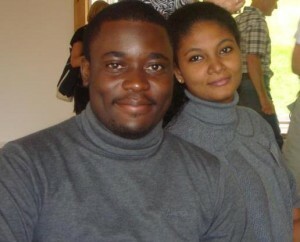 In Kenya, Joseph and friends held circle discussions about the concept, whilst in New York, Joanne also shared conversations about money with her 11th grade students. 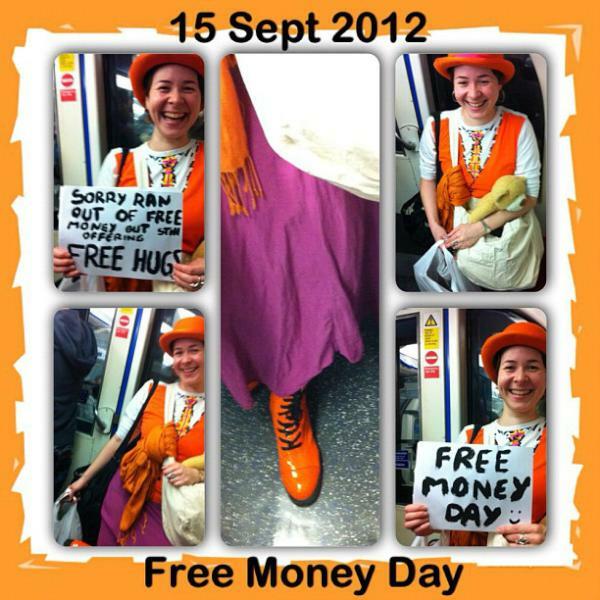 The main words used to describe the 2012 Free Money Day were ‘fun’, ‘apprehension’ and ‘appreciation’. Many participants shared how fun it was to give away their own money – particularly when it was warmly received. In Utah, Roger handed out two $1 bills to each of his IHOP restaurant co-workers in their break room, saying: “your mission, if you choose to accept it, is to keep one and give the other to someone else.” The result: “it sparked a lot of fun discussion and it felt great to be charitable”. Robyn, on Australia’s east coast, dropped money into people’s gardens and was delighted to read on her friend’s Facebook page that it had “been raining money and that he kept finding $5 notes in his yard”. 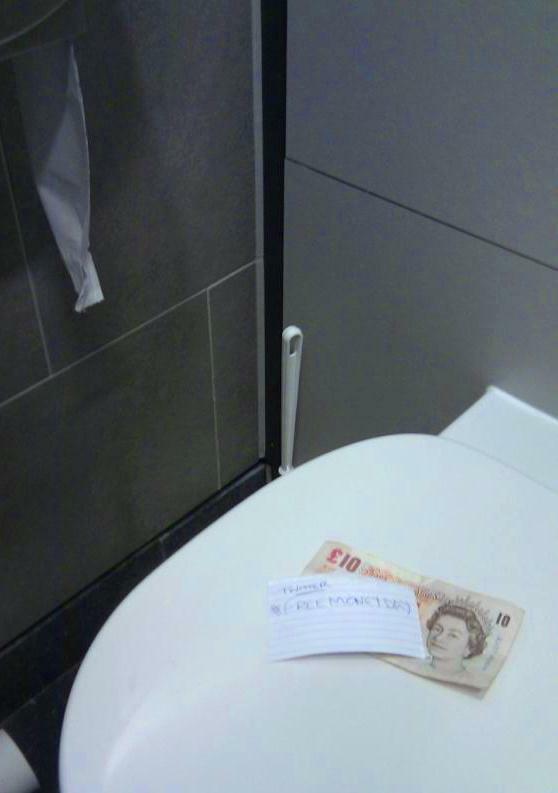 Cila’s Free Money Day at Liverpool Station in London, U.K., stemmed from incredible serendipity. Suzanne made this creative video of her fun experience handing out money in a park in Charlotte, U.S.A. On the United States’ west coast, things got contagious in San Francisco, with a member of the public taking up Caterina’s offer to see what it felt like to hand money to strangers. In Washington D.C. where I and two others handed out close to $600, some people were ecstatic; literally jumping around. At one stage, word must have got out to the neighbourhood, because people came running in from all over, smiles beaming. Yet, rather than just wanting ‘free money’, many people wanted to hang around and chat. On a deeper level, perhaps there is something to learn from the response Alix received in San Francisco, that “nothing is ever free”. After one particularly challenging experience in Portland, Brian realised that “…in actuality, I was expecting that the other person be excited or maybe even thankful in return…I wanted the recognition…”. In this sense, a number of people commented that reflecting on the challenges they faced handing out money was important for their own journey. One sad soul took the money, insulted me, was aggravated that his picture was taken and after we deleted the photo told us he would take the money and not share it at all. I probably got the most out of the worst experience. That person let me understand gratitude as something to experience from the inside, not the outside. I thought I understood this before, but I feel it more now. In terms of reducing unnecessary apprehension, we learnt three main things. Firstly, having more than one person handing out money at the same location is less intimidating for all involved. Secondly, that physical proximity matters – people were more likely to engage when spoken to within a radius of no more than 2 metres; beyond this distance, the raised voice perhaps lends itself to fear someone is selling something. And thirdly, mentioning in a non-instructive way to people who might at first wave you away that they ‘might like to pass half on’, seems to draw in a number of perhaps otherwise unlikely participants. As our global landscapes experience unprecedented seismic disturbances, my wife, Ej, and I have often wondered about how best we can transit into the life our hearts tell us is possible – into a world in which time and space are not commoditised properties of the industrial complex. Our disenchantment inspired us to initiate the Koru project, but we needed some sort of ritual to loosen us from the strongholds of our dying civilization. You can understand our excitement when we learned of ‘Free Money Day’…To us, the day represented a re-enchantment of the sacredness of gifts and our shared selfhood – a way to resuscitate the wealth of togetherness, the lack of which has severely impoverished the world and our imagination… The Day inspired us to connect with others, to see ourselves as conduits of the universe’s bountiful wealth, to realize that we are songs that the impeded stream sings. Ej bakes great cakes, and we are finding ways to share them with those around us! Free Money Day helped us realize that a new world is not merely possible on the pages of a skilled wordsmith, but on the streets of our aching cities, in-between the exchanges of supposed strangers, and through the visions of the many and the few. I had my doubts about Free Money Day (I didn’t quite see the point of handing out money to complete strangers in a western country when those whom I would be handing it out to didn’t really need it) right up to the time when I handed across my first 10 Swedish Kroner (in two 5 kr coins) to a stranger at a potluck dinner…Following initial apprehension, the recipient was so excited and the process continued all night long…I felt like I was helping people take a blindfold off their eyes that neither they or I knew was there…by publicly showing that we can approach money not as something to hoard but as something to share, I really feel I helped people to unlock its full potential and embrace the power of paying it forward. On the whole, younger people were particularly appreciative of the Free Money Day philosophies and experience. 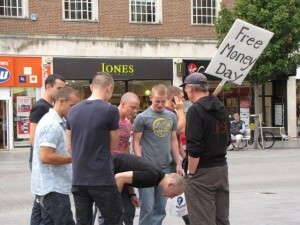 Here are Louise’s kids preparing for Free Money Day in Eastbourne, U.K. 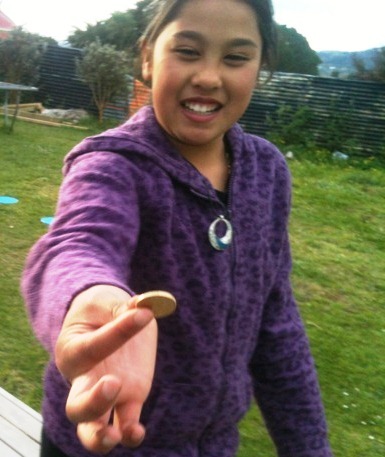 In Gisborne, New Zealand, Manu gave coins to neighbourhood kids “…on the condition they gave half of it to someone else” which they did, to his surprise. 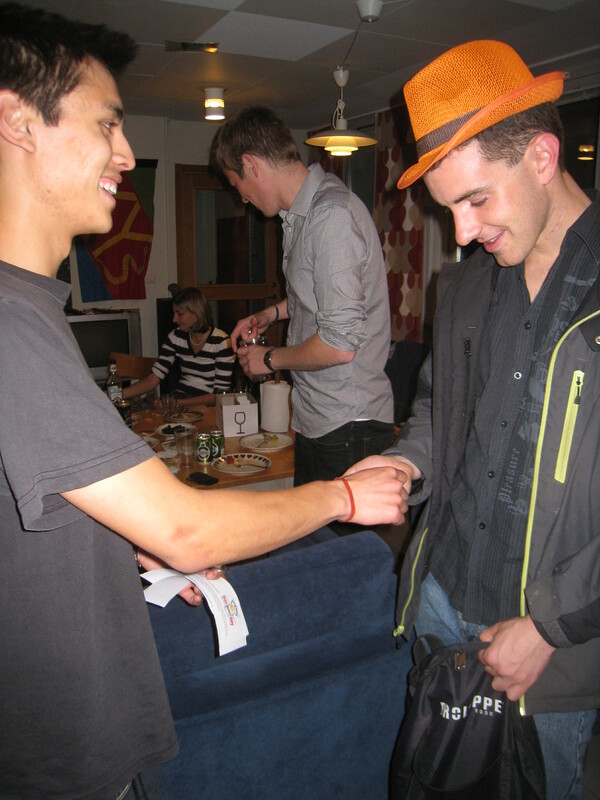 At Ghee’s event in Exeter, U.K., one bunch of young men were so amused, they actually all put money in rather than take it out. Together, they talked about greed versus generosity; how much is enough; and why some humans find it hard to trust a person giving something away with ‘no catch to it’. Karen in Amherst, U.S.A, found young people the least suspicious, although Kate, who handed out coins at a private school fete in Sydney, found teenage boys both suspicious and dismissive! As an organiser, I also appreciated discovering other likeminded initiatives through the course of this event. These included the free 5 Euros experiment in Ireland, 2011, Art in odd places (maintained by @moneyactions), Yerdle – a soon to be launched gifting economy, and OuiShare – a collaborative economy community in Europe. In 2013, we’ll be looking to improve the experience through a more interactive web platform, earlier promotions, and translations of the site and materials from English to multiple languages. We will be encouraging the pledging of gifts beyond money, and exploring a partnership for online gifting with Pygg. For all our wonderful participants, or readers seeking to create ripples on limited budgets (and lots of voluntary hard work), you might be inspired to know that Free Money Day, as a global event, was organized on a budget of US $120! When I gift, I rebuild trust. 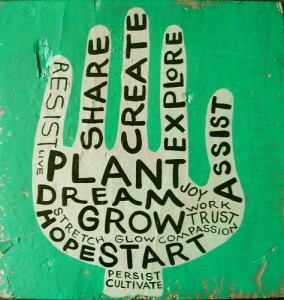 When I share, I delight in life’s joys whilst respecting the differences that make our interactive journeys meaningful. But, for mine, the real value of money for nothing surrounds the sharing of love. As Mark Boyle, the money-less man, so eloquently puts it: “…if you spend your time putting more love into the world, then it is reasonable to believe you are going to benefit from a world with more love in it”. Wendell Berry, that poetic shaman of new worlds, conjured up the following words once: “The mind that is not baffled is not employed. The impeded stream is the one that sings.” As our global landscapes experience unprecedented seismic disturbances, my wife, Ej, and I have often wondered about how best we can transit into the life our hearts tell us is possible – into a world in which time and space are not commodified properties of the industrial complex. Our disenchantment inspired us to initiate the Koru project, but we needed some sort of ritual to loosen us from the strongholds of our dying civilization. You can understand our excitement when we learned of ‘Free Money Day’. We looked forward to the day and made plans to give away money; we even helped publicize the day and told friends about it. To us, the day represented a re-enchantment of the sacredness of gifts and our shared selfhood – a way to resuscitate the wealth of togetherness, the lack of which has severely impoverished the world and our imagination. Unfortunately, we couldn’t embark on the exciting quest to give away money along with other people around the world on Free Money Day! For reasons that concern our workplace demands and constraints, we missed out on so much – connecting with the field of collective consciousness that must have enveloped people around the world. We reasoned, however, that the ‘real’ legacy of the Day must reside in its rhetorical ability to instigate new practices and inspire new ways of being. We may have missed out on the Day, but we haven’t missed out on the days that it birthed. Ej and I have since given out lots of money. Being academics, we tend to live isolated lives – hunched over a new book or our slides for a pending presentation. The Day inspired us to connect with others, to see ourselves as conduits of the universe’s bountiful wealth, to realize that we are songs that the impeded stream sings. Ej bakes great cakes, and we are finding ways to share them with those around us! We connect with those beautiful souls around the world who are courageously replacing the seeds of separation with the ferns of entanglement. The world is a habit of projection, and our most critical opportunity today is to project new stories on our tortured spheres of interaction. Free Money Day helped us realize that a new world is not merely possible on the pages of a skilled wordsmith, but on the streets of our aching cities, in-between the exchanges of supposed strangers, and through the visions of the many and the few. How magical does the world appear when witnessing the unstoppable spread of human generosity? It seems that everywhere I turn people are discovering the joy of sharing; from giving free hugs, to distributing excess produce or holding a National Sharing Day. The scientific studies continue to report the welcome news: there is immense value in sharing, especially for the giver, and especially when giving happens without any expectation of receiving. And simple generosity can sure be creative, as so many are showing through their plans for Free Money Day this 15th September! In Lisbon, Portugal, owner of the Cinetekavideo store, Gonçalo Peres, will be giving free rentals to all his customers, encouraging them to give the money they would spend on rentals to strangers in the street. In Moerewa, New Zealand, musicians Emma and Derek will be busking. But rather than collecting money, they’ll be giving it away! This story of generosity became more incredible when I learnt that Emma is a fully registered and qualified early childhood teacher yet spends nearly all her time volunteering with community organisations. In Mexico City, Axel and his friend are shaking things up by giving their money solely to beggars – with the request that they, in turn, pass half on to strangers. With a fair bit of tension in Mexico of late, and enormous social disparity, Axel believes this could draw attention to these issues in a novel, yet respectful way. Others are finding ways to incorporate Free Money Day into existing commitments. In Brisbane*, Australia, Kath has a theatre rehearsal on the 15th. But that won’t stop her handing out coins to unsuspecting colleagues and staff at the venue! In Plymouth, Anji reports that her daughter’s 7th birthday party coincides with Free Money Day, and that she’s going to put 7 pence in each child’s party bag, with a note explaining her motivations for sharing! In Paris, Olivier and others have scheduled their Free Money Day to merge with the visit of Vietnamese peace activist Thich Nhat Hahn and the planned Day on Conscience and Freedom. Further South, on the Spanish border, Sally will be handing out Euros in the breathtaking Pyrénées National Park. Meanwhile, Cameron is thinking of handing out money to passengers on an aeroplane, and, as in 2011, Creative Crip will be paying it forward via Twitter. I also received incredible news from South Korea last week. A researcher, Layne, and his village economist wife, Patcharin, are so inspired by Free Money Day that they are giving away half their small land holdings (7 acres, enough to support 7-14 families) in Chiang Mai, Thailand, to begin a land trust for up and coming permaculture farmers. Their offering is made in solidarity with the wonderful work of groups like Via Campesina. The interest from across Africa and Asia has been particularly exciting. From Ghana to Nigeria, Kenya, India and Thailand, I have been reminded that many of my brothers and sisters in the Global South also seek alternatives to the mantra of endless economic growth. How truly magical this world appears when I build on what I know already works: observing, respecting, loving, and sharing. 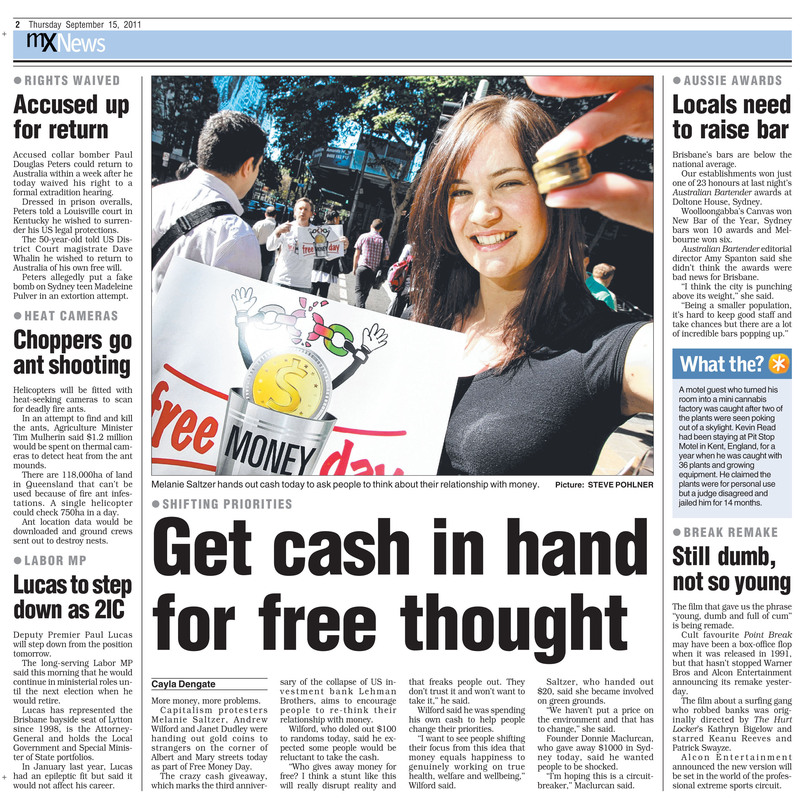 *I’m so glad there will be action in Brisbane, given this year’s Free Money Day is dedicated to the late, wonderful Andrew ‘Wilf’ Wilford, whose 2011 Free Money Day efforts in Brisbane received national attention. Congratulations and gratitude to everyone who participated in the 2011 Free Money Day! The event was an overwhelming success. With 63 events in 43 towns and cities, in 18 different countries, there were an estimated 1462 recipients of free money who then passed half of it on to someone else. (Approximately $2759 AUD was given away on the day). It was exciting for us at the Post Growth Institute to see the diverse ways the event was taken up around the world. One participant mailed money to strangers, one placed it in random places accompanied by drawings to give away with it, and another engaged in a virtual Free Money Day campaign. Some people approached passers-by, while others waited to see if strangers would approach them. As a social experiment, the options were endless, and we are looking forward to hear more about how it all went. Participants everywhere seemed to engage with the deeper ideas behind the event. As a result, the conversations that emerged on the ground, in cyberspace, in print, and on the airwaves were dynamic, and already wheels are turning in new directions. For instance, Brendan Rigby suggests adapting the ideas behind Free Money Day to inform not only ‘economies of sharing’ but education based on sharing. Donnie noted at one of the Sydney events that people were much more eager to receive when they learned about the expectation to pass something on to someone else, strengthening the idea that sharing really is what it’s all about! And Nadia Bunce, blogging at Ethical Nippon, contextualizes Free Money Day within the larger movement of anti-materialism and the philosophy of slow. In order to keep the conversations going, don’t forget to share your photos, videos, and experiences with us so we can make them available to others. Also, if you have constructive feedback or ideas for future events, we’d love to hear from you. With the Post Growth team having just held our Free Money Day event debrief, we’re now looking excitedly at how we can make this event even bigger and truly axis-changing in 2012! We look forward to the shared journey ahead. 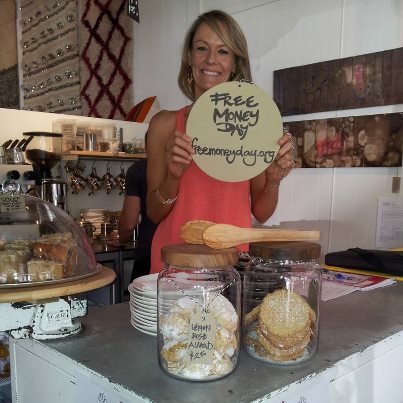 Here are some of the photos from one of our exciting Free Money Day events in Sydney, today. More photos at: flickr.com/freemoneyday/ (video coming soon). 56 events, 37 cities, 17 countries! Almost $3000 AUD (equivalent). Sharing is common cents! Handing out 1000 $1 coins in Sydney this morning was the most incredible experience! Pics and videos to come.